With good action and an entertaining story, this movie delivers in entertainment. A very good movie, this one fits right up there with the last two films of the series. All three have been very entertaining (ever since the lousy second entry.) With this fifth movie, Tom Cruise is at it again as Ethan Hunt, and this time he’s going rogue. Cut off and disbanded by the C.I.A. who has taken over his MI6 team, Hunt is out there on his own and going after an organization known as the Syndicate. He’s got Rebecca Fergusson playing a double crossing agent named Ilsa to keep her company. The thing about her is that you never can be sure which side she’s on. And the two of them get into some crazy situations, be it a torture dungeon scene, an opera house catwalk fight, or a motorcycle chase around the mountainside. All of this is great and exciting stuff. The movie definitely works, adn I especially like the way, (despite Ethan seemingly being rogue), little by little, we get the other members of the team to join in the fun. Mission Impossible: Rogue Nation is a very fun movie. In fact, really the last three Mission films have all been pretty good, and this one fits right alongside those others. The third movie, directed by J.J. Abrahms and starring Phillip Seymour Hoffman as the villain, was the best of the bunch. But then the last installment, Ghost Protocal featured some of the most incredible stunts ever put on film. Mainly that Dubai building sequence. And now we get Rogue Nation. It is good, but not as strong as the two that came before it. That’s okay though, because all of these movies are enjoyable, and it’s quite possible that they take multiple viewings to really appreciate (that was certainly the case with the last film.) Either way, the movie is fun and well-made and there is a lot to appreciate here. For starters, I really like how this franchise has brought in a new director with every single film. That’s something they’ve done ever since the beginning, going from Brian De Palma to John Woo with the first two movies. And then Abrahms and Brad Bird after that. Now, for the fifth movie, we have Christopher McQuarrie at the helm. This is a very smart filmmaker. He wrote the Usual Suspects, which is still his most impressive screenplay, and then has had a number of ups and downs ever since. McQuarrie even directed Tom Cruise recently in Jack Reacher. Now, with a Mission Impossible flick, he’s been given his biggest budget to work with yet. And he pulls it off nicely. In fact, the film came in ahead of schedule. This movie was all set to be released in December and then Tom Cruise (who is not just the star, but also the producer of the entire series,) realized it was done and ready to go. He saw an open weekend at the start of August and said, “let’s do it.” Then the studio got behind him and moved the film up. You rarely see that happen. Movies get pushed back all the time, but to get pushed up is almost unheard of. But that’s the kind of energy this movie has going. It knows that it’s good and it doesn’t want to wait to share that with us, (plus by getting out of the fall / winter seasons it avoids being anywhere near the next Daniel Craig Bond movie, Spectre, and gets out of the gate before that film.) The movie begins with that amazing plane stunt we see in all the trailers and on all of the posters. Yes, Tom Cruise really did strap himself to the side of a plane as it took off. Yes, they did this stunt again and again until they got it just right, and any other actor in the world would have used CGI. But Cruise is a maniac, and I mean that in the best possible way. He really cares. That’s probably the reason why he’s still on top of his A game and headlining movies like this, instead of turning up in an Expendables movie. You look at the other actors who were action stars back in the nineties, (Mel Gibson, Travolta, Bruce Willis, Harrison Ford), and they have all nearly gone away (all except for Denzel.) Cruise is competing in a younger class. He’s competing with the new action stars. I’m not talking about age, I’m talking about relevance. Cruise is competing with the Matt Damons and Daniel Craigs (Bourne and Bond, respectively.) I wonder if decades from now we’ll remember this time, right here, as the time when there were three different spy series all competing at the same time and all doing remarkably well. Like Bond movies, this film doesn’t waste any time. The plane sequence is very impressive and from there, the movie gets right into its storyline with Ethan Hunt (Cruise) on the run overseas. He’s chasing after an organization that calls themselves The Syndicate. Meanwhile Brant (Jeremy Renner) back in Washington D.C. and Langley Virginia, is dealing with the C.I.A. This is the first Mission movie to encounter the C.I.A. and it’s about time. The other films wanted to exist in a totally fictional world where this group the MI6 or IMF (Impossible Mission Force) did secret jobs that nobody else wanted or knew about. I love when movies in this series introduce something new that the writer / director probably thought we’ve always been wondering and now they can finally answer. The third movie did it by giving Hunt a wife. It introduced us to his home life, making him seem like a real person for the very first time. The mistake was that they didn’t sign Michele Monaghan to be in future films. And like every other female costar in the series (Maggie Q, Paula Patton), she pretty much walked. Her being nowhere to be found in this fifth movie (and to some extent in the last one,) is one of the big unanswered questions of the series. But regarding this new movie, what it does add to the mix is bringing in the C.I.A. as a sort of competing network of spies. Now for the first time we can see where the Mi6 division fits in and what the C.I.A. thinks of them. It’s a nice touch. Alec Baldwin is in charge over there and he wants the MI6 disbanded. He and Brant are locked up in hearings about this, with Brant refusing to confirm or deny any actions over the years that the team might have been responsible for. When the decision comes down to eliminate the division and bring the members in to join with the C.I.A., Hunt suddenly feels like he’s out on his own. He’s right in the middle of something, hot on the tracks of the Syndicate, and he is in no position to give up his mission. At this point, when he finds out the news about the change in Washington, Hunt has just made it out of a pretty cool prison – torture sequence. That whole thing started with Hunt falling for a trap where the people who made his mission tape (the whole, “your mission should you chose to accept it,” and “this recording will self-destruct,” business) are actually the bad guys. They now trap him in a glass room filled with smoke and when he wakes up, he’s in a sort of basement dungeon. That’s when the torture sequence begins, but it doesn’t get very far before Hunt escapes. He gets the help of a mysterious woman who is there, Ilsa Faust (Rebecca Fergusson), and the way that Hunt uses his body like a gymnast to slide and pull himself up a pole, is pretty awesome. From here, it’s time for Hunt to get a little help and start bringing in his team members, one at a time. First up is Benji (Simon Pegg) who Hunt gets to come and meet him at the Vienna Opera House. That turns into a cool fight sequence on the catwalks of the opera, while the performance is going on right underneath them. And then it’s an underwater retreival sequence where they need to get a disk which is being stored under a tank in a time sensitive pressure chamber. It turns into a very cool scene where Hunt is constantly getting knocked around by machines spinning through the tank, all while trying to hold his breath and get the disk. By the time they get the disk, we are headed into some double crosses involving the British Intelligence agency where Ilsa works and this leads us to a car chase turned motorcycle chase. Hunt rides on both. There is some pretty fanastic stunt work here. Cars flip around in the air. Motorcycles crash. And we get one spectacular moment where Hunt and Benji run into Brant and Luther (Ving Rhames, reprising his role from all of the movies in the series.) 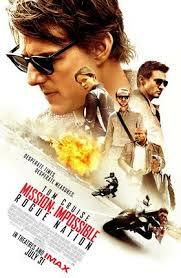 This movie does not hold back on action, and the stunts are all creative and fun. By the time the motorcycle sequence is over, we are at an interesting point. We’ve now seen everything the trailers had to offer us, and yet there is still a good amount of the film left. Normally at this point in an action movie, you still know some of the stunts that are coming. That is certainly the case with all of the Fast and Furious movies. These films throw everything into the trailers, so that there is very little surprise for the people going to see the film. But here, in this fifth Mission film, it’s a nice feeling to not know what’s coming next. That leads us to some more cool double crosses with the British Intelligence. And then it’s time to get the villain. He’s a pretty memorable baddie here, mainly because of the way he talks, and his cool, collected persona. This guy has got nothing on Hoffman from movie three, but he reminds me of the villain from the first Daniel Craig film, Casino Royale. He’s menacing and mysterious all at the same time. And it’s kind of cool that we get to see him from different points of view including watching him work with Ilsa even though neither he nor us have any idea which side she is actually on. This movie really goes strong all the way to the ending, which involves a cool way of getting the villain. This is the kind of thing that seems memorbale (unlike the last movie, where I still don’t remember how they caught the villain, despite having seen the movie a number of times.) There’s a lot to like about this movie. One thing is that the series really does keep bringing in a new player with each movie and expanding the universe. The first two movies gave us Ethan and Luther. The third movie gave us Benji. The fourth movie gave us Brant. Now, it seems, the fifth one is giving us the Alec Baldwin character who is welcomed to the team at the end. I don’t know why they can’t get an actress on the team to stay with the series, but maybe one day that will change. In the meantime, this movie definitely delivers. 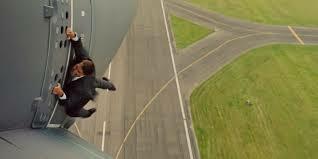 Mission Impossible: Rogue Nation might feel a little too much like the recent Bourne and Bond movies, (with the group going rogue and beind disowned by US intelligence who are also trying to bring them in,) but it’s still got a clever plot, some great stunt work, and happens to be a lot of fun.